Browse: Home / Now Airing / Legends of Tomorrow / Season Two / Invasion! With help from Team Flash, Team Arrow, and Supergirl the Legends work on a plan to stop the Dominators’ invasion of Earth, sending a team back to their original landing in 1951. Stein works with the daughter he never had, aware that he may have to correct his mistake and erase her from existence. 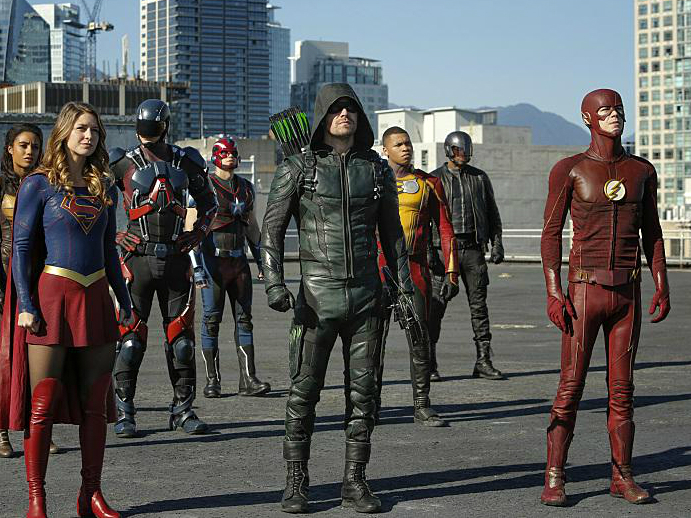 After learning the Dominators plan for the world, the Legends must work together with The Flash (guest star Grant Gustin), Supergirl (guest star Melissa Benoist) and Green Arrow (guest star Stephen Amell) to kill them once and for all. Meanwhile, Stein (Victor Garber) figures out, with the help of others, how the team can terminate the Dominators, but is distracted by the aberration he realizes he created in 1987. Brandon Routh, Franz Drameh, Dominic Purcell, Maisie Richardson-Sellers, Nick Zano and Caity Lotz also star. Gregory Smith directed the episode written by Phil Klemmer & Marc Guggenheim (#207).